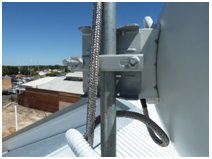 I am delighted and privileged to write this review of Shire of Katanning’s CCTV and Wireless Implementation, completed by Avantgarde Technologies. Shire of Katanning recently received funding from the State CCTV Strategy Infrastructure Fund to purchase a new recorder to replace our existing server that was in desperate need of replacement. The funds were also used to install cameras to cover “Offences against Persons – Hot Spots” identified by the Katanning Police and to enable the Police to retrieve footage. Avantgarde provided the winning quote to both install an entirely new CCTV System and to bring on existing cameras in other locations throughout the town. Avantgarde also replaced the Katanning Police’s dysfunctional CCTV Workstation with a high powered PC capable of allowing 16 cameras to stream live and view clear, high quality footage displayed on a huge wall mounted monitor. The Hikvision selection was the perfect choice, being very cost effective and providing high quality footage both day and night. The Hikvision PTZ cameras provide incredible zoom capabilities, demonstrating the ability to view with ease, a numberplate at over 90 metres. They also enable the Katanning Police to spin the cameras almost 180 degrees, which has provided footage in areas not included in the Strategy, such as the Petrol Station across the road. I am extremely impressed with the Hikvision 180 degree camera monitoring the Shopping Carpark, this camera provides an overview of the entire area. Hikvision cameras have outstanding night vision. Stainless Steel Braided Sheath on a Roof Antennae. What really impressed me, was the attention to detail. Avantgarde enclosed all outdoor cables in Stainless Steel Braided Sheath. This will provide protection from both vandals and birds. As a qualified Electrician, I am happy to report their wiring standards and neatness is beyond compare. Avantgarde was faced with many challenges (fixing some issues at no cost) including bringing the old cameras online and re-used existing equipment where possible. It was a pleasure to deal with Avantgarde as I found them to have a passion for our CCTV project and a determination to create the best CCTV network possible. I was also impressed with their willingness to share knowledge and provided patience at times when I didn’t fully understand. The training provided was not difficult as the Hikvision software is very user friendly. I would not hesitate to recommend Avantgarde Technologies for any project or undertaking, whether it be Security Alarm Systems, CCTV, IT Networks or Electrical Installations. Anglicare WA consulted Avantgarde Technologies to upgrade our corporate email systems to Exchange Server 2013. Avantgarde came in and ran what they called a “technology workshop” with our IT department to capture our business requirements around email such litigation and retention, business continuity, and disaster recovery. Avantgarde also ran us through all the features and functionality of Exchange Server 2013 allowing us to pick and choose what features we wish to implement up front. The knowledge demonstrated in this workshop by the consultant was exemplary. From the information gathered during the workshop, Avantgarde put together a design which they ran us through in detail answering all our questions and concerns. When we were happy with the proposed design, Avantgarde put together a project plan. This document clearly listed the deliverables based on our requirements put forward during the workshop, any project constraints and exclusions, a responsibilities matrix, risks and assumptions as well as a work breakdown of all the tasks which need to be completed throughout the project. Avantgarde gave us the opportunity to perform some of the tasks in the work breakdown ourselves thereby enabling us utilise skillsets that we already possess within our team and meet project budgetary requirements. During project implementation, Avantgarde followed the project plan they put in place and kept us updated on progress throughout implementation by getting us to sign off against each project milestone throughout the project lifecycle. The new infrastructure was built alongside our existing email servers to insure no disruption to the business while the various configuration tasks were undertaken. When the new infrastructure was ready, Avantgarde put together a migration strategy to carefully migrate our 600 users across to the new Exchange 2013 infrastructure over a weekend. The migration was successful with zero impact to business services during this period. After the new Exchange 2013 environment was built, before performing project handover, Avantgarde ran a training session with the IT department at Anglicare WA. This gave us confidence with the skillsets we require to administer and maintain an Exchange 2010 environment. As the IT Manager of Anglicare WA, I was very impressed with the work put forward by Avantgarde Technologies on this engagement. The quality of the solution met our requirements spot on and project delivery was outstanding. I would not hesitate to recommend Avantgarde’s professional services team to other companies. Jacaranda Community Centre is a non for profit organisation based in Belmont which helps the community with family support, financial counselling, court support and much more. Jacaranda Community Centre has outsourced all IT Management matters to Avantgarde Technologies including IT planning, Server Infrastructure maintenance and operational support. Avantgarde Technologies conducts business in a professional manner, is flexible and responds to all issues in a prompt and timely manner. As a small business, we require an IT company we can trust, is personable and someone whom we can build a long term relationship with. Avantgarde Technologies ticks all these boxes. City of Kalgoorlie-Bolder has been using Avantgarde Technologies over a three year period for various consulting engagements in the Microsoft space and internal operational support which requires escalation. Our most recent engagement is the implementation of a Bring Your Own Device (BYOD) solution to enable our users to access our corporate applications from any device (including iPad and Android) in the office or remotely over a secure connection. Avantgarde Technologies has exceptional knowledge in the Microsoft space and we highly recommend them as a preferred WALGA supplier of ICT services. The Shire of Gingin has worked closely with Avantgarde Technologies to migrate from aging physical infrastructure to a virtualised environment. In addition, Avantgarde have provided expert advice for Disaster Recovery planning and ad hoc support for day to day issues. Avantgarde’s professionalism and responsiveness are qualities that make for a successful relationship and I have no issues endorsing their abilities. Avantgarde Technologies are subject matter experts in both system and network infrastructure. They have been involved in redesigning our core network and disaster recovery plan to ensure all mission critical services are clustered and highly available. In addition to specialised project work, Town of Port Hedland also utilise Avantgarde Technologies for maintenance services and strategic planning of our information systems. Avantgarde Technologies are a small team of industry experts however they have delivered for the town projects which larger international consulting firms could not. I as the Manager of Technology for the Town of Port Hedland highly recommend the services provided by Avantgarde Technologies. Office Automation has developed a software system that allows business processes to be automated to surprising levels. After initial set-up to our client’s method of doing business, these automated processes continue working for years providing a massive ROI long into the future. The Office Automator software combines the ability to generate automated processes with enterprise standard document management, email tracking, financial management, human resources (including contractors) management and with full security. Clients use these systems for whole of business management and efficiency or customise it to individual objectives such as project’s where it is important to control all documents and processes, secure legal compliance and risk management and lock away the full history of the Project to ensure nothing is ever lost. We are keen to remain in front of our competition and adapt to changes in technology so we wanted to remove the legacy requirement of having to install our application before using it and provide our clients with the ability to use our application from any PC in the world, on the fly and hassle free. To achieve this, we consulted Avantgarde Technologies to build a Software as a Service (SaaS) solution to enable our customers to better utilise our applications as a cloud service. Avantgarde provided advice on getting our products ready for a SaaS model, built a load balanced farm of servers to run the application instances, set up the remote access portal and made the necessary network configuration changes. This work was fully captured in an “As Built” document providing us the ability to understand how the environment was configured and so we can troubleshoot and maintain the environment internally. We now have customers around the world using our products as a cloud service and have received great feedback. The City of Armadale has engaged Avantgarde Technologies on numerous engagements around redesigning their core information systems including clustered Exchange 2013 with disaster recovery and an Active Directory redesign. On all engagements, Avantgarde conducted themselves in a professional manner, provided clear scope documentation surrounding the project engagement and excellent build documentation. The City’s approach to these types of engagements is to focus on best outcome both at the technology and business levels which requires a solutions partner with specialised knowledge and proven track records that understands a very diverse business model. The outcomes provided by Clint and his team have been outstanding and have achieved outcome focused best practice implementations that suit our business model with minimal interruption to the business. The Avantgarde team will invest the time to tailor the solution to the business and not just deliver cookie cutter implementations which is their biggest differentiator. Above all they will work for you and deliver to your needs. Well Done! Avantgarde Technologies greatly appreciates the time taken by our customers to share their experiences with Avantgarde's services.